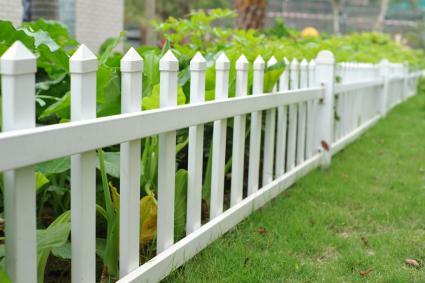 Installing a new fence is a major expenditure and one that cannot typically be undone easily. For situations where you need a fence for anywhere from a few days to a few years, a variety of removable fences are available to get the job done with minimal labor. If you need to reconfigure the fence at some point along the way, there are many models that can simply be pulled from the ground and reinstalled in a new position. Numerous light-duty removable garden fences are on the market today, from traditional white pickets (like the one pictured above) and wrought iron to sleek, modernist styles. Some are free-standing, while others have stakes at the bottom that are designed to be pushed directly into the ground and clips that hold the panels together. For the best-looking design, use a material that matches the color and style of your house or other existing features in the landscape. 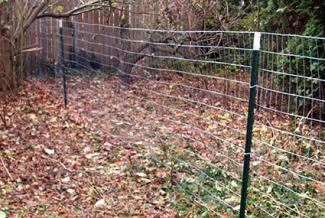 Take care to install them in clean, straight lines, using a string stretched between two stakes as a guide. These are freestanding fences by nature and are often used to contain small children in an outdoor setting - essentially functioning as a large playpen. 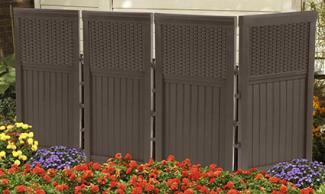 Patio fences, such as models available from Doheny's, are also handy to use as temporary screens around trash bins, air conditioner units or home improvement projects that are in progress. The stand at the bottom of patio fences that keeps them from falling over in the wind makes them unsuitable for use on sloped ground. However, designed with the overall look of the patio furniture and exterior of the home in mind, they are a pleasing way to enclose outdoor entertaining areas and can be easily rearranged or disassembled for storage when needed. This type scores high marks for its aesthetic quality, reminiscent of a tropical village with thatched roof huts. It is not the most durable, however, and typically only lasts a few years before it starts to decompose (or less if it is subject to high winds). 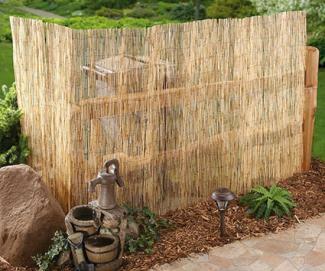 Reed fence is available online in rolls 6 feet tall by 16 feet in length and requires posts for support. It's a great option when instant privacy is needed on a deck, patio or poolside area and can even be attached to an existing 'see through' fence to improve the look of the fence and block an undesirable view. 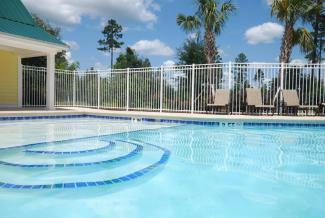 Removable pool fences are for those wanting the option to secure the poolside area when they can't be there themselves. The fence panels are designed to clip into heavy duty steel anchors, which must be permanently installed in the pool deck. Before you go out of town, simply drop the panels into place and travel with the peace of mind that no one will be able to access the pool area while you are away. They are intended to serve a utilitarian purpose and are often used in situations where a permanent fence surrounding a pool is undesirable for aesthetic reasons. In order to keep them from being an eyesore, it's best to install them along the straight edges of the pool patio rather than out in the middle of the patio, as this photo demonstrates. Snow fence comes in two main types - brightly colored plastic mesh, that is purely utilitarian, and wooden slats held together in a wire framework (as pictured here), that has a charming, rustic look to it. The applications for snow fences are by no means limited to containing snow piles; they are useful anywhere that an inexpensive, easy-to-install fence is needed. The aesthetic of the wood slats fits perfectly with informal cottage gardens and rural properties. They typically come in rolls 4 feet tall and 50 feet long. Snow fencing is reliant on metal stakes to support it (sold separately), which must be pounded into the ground with a sledgehammer - don't pound them too deeply if you want to be able to remove them later. Using a string stretched between two stakes is the best way to install it in a straight line and prevent the fence from meandering. The woven wire fencing commonly used by farmers to contain small livestock is a feasible material for a temporary fence, though it definitely has a utilitarian aesthetic. For a sharp-looking installation, start the fence on a corner of the house or other structure with straight lines and right angles. As you line out the path of the fence, keep the lines straight and the angles at 90 degrees so that each section is perfectly parallel or perpendicular to the others. Metal T-posts are used for support. These posts are quick to install, but not always easy to remove, especially in hard, dry earth. There is a device known as a T-post puller that works like a jack to leverage the posts out of the ground - a must if you have more than a few to remove. 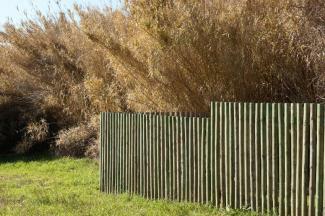 Removable fencing is often used as a quick fix, but that doesn't mean it can't be attractive. Besides taking the time to install the fencing straight and level, don't forget about all the ways to dress the fencing up and make it a beautiful part of the landscape. Fast-growing vines are a great way to do this, whether with annuals like nasturtium that can cover a 6-foot fence in one growing season with their bright orange blooms, or lightweight perennial vines like clematis with its saucer-size purple blooms. Hanging baskets with draping foliage are another way to quickly blend removable fencing into the environment, whether around a pool, patio or play area. Attach L-shaped brackets to the posts for support and hang your favorite displays of seasonal color. Because removable fences aren't set in concrete and built perfectly level and square, they shouldn't be seen as refined architectural features, so much as simple solutions to short term needs. Used tastefully, they can fit right into the overall landscape design and function as worthwhile placeholders while permanent solutions are contemplated.